There she stood, much taller than she was four years ago, with her brownish-auburn hair flowing gracefully over her left shoulder. Smiling nervously, she looked at me through the dark square framed glasses, my now 14 year old niece, Melanie. Brief awkward hugs were exchanged with her in front of my parents. They have longed to have their second born granddaughter in their lives for all of these 14 years, yet had to settle for occasional visits here and there. Now, though, we were all together sharing in this moment with Melanie. We made our way at dusk dark through the Christmas decorations that lined the Children’s Christmas Garden. Looking around, we found our place on the cold, hard, steel bleachers that were set up for this occasion; The Angel of Hope Ceremony. I left my seat for a moment to fetch a long stemmed white carnation. Returning to the front row of the bleachers, I smiled as I offered it to Melanie. I previously explained the ceremony to her and gave her the carnation for her to place on her mother’s plaque at the appropriate time in the ceremony. As the ceremony began, it was an emotional time for so many that were gathered with us. 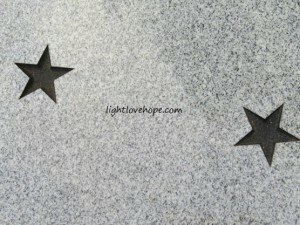 The purpose for the Angel of Hope Ceremony is to recognize our loved ones that have gone too soon. 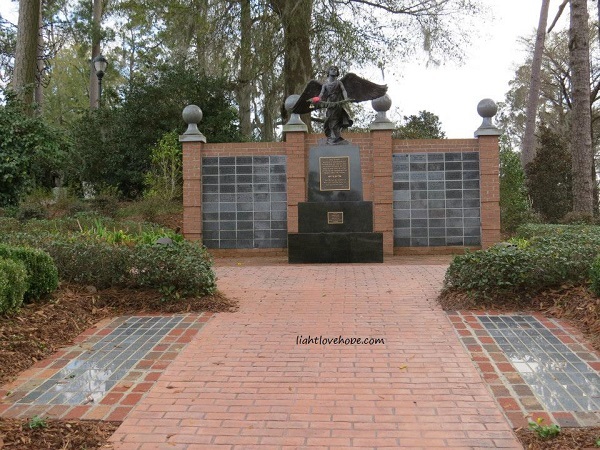 While the idea behind it was for parents who have lost their children, I paid for the plaque to be placed for my sister as my parents did not have the funds to do so at the time the statue was erected. 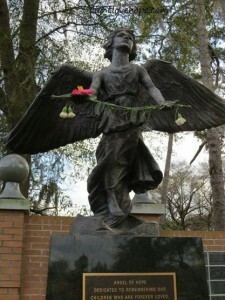 It is often hard for me to visit the cemetery as I get too emotional when I go, so the Angel of Hope Garden is a place I can visit to remember my sister and to honor her. It was my hope that others would find comfort there under the Angel as well, and I believe they have. As the names were called out, pictures were shared on the screen so that everyone in attendance could see the person that we were honoring and remembering. Much to our surprise, they were not all little children at all. The majority were pictures of adults, but honestly, they are someone’s children no matter how old they were when they passed. 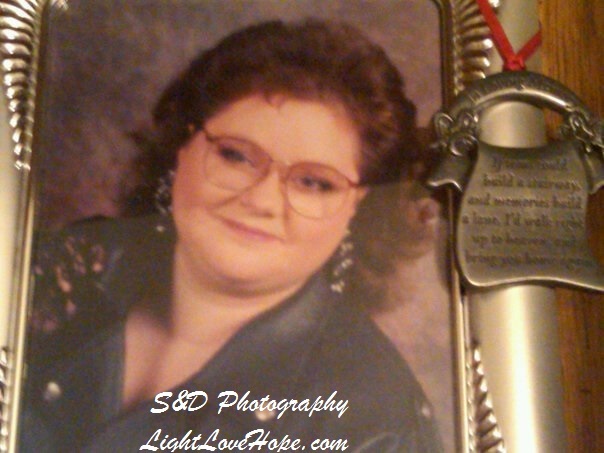 That is exactly why I had this plaque placed for my sister. Although she passed at the age of 33, she was still – and will always be – my parent’s oldest child. We paused for a moment when my sister’s name was called, “Pamela H. Smoak.” Finally we rose to our feet, my husband and I, Melanie, my dad and mom, as well as my two beautiful daughters who were sitting on the end. 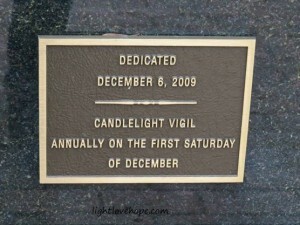 We made our way down the lit path toward the Angel of Hope, and as we reached my sister’s plaque, we paused once more. Melanie placed the white carnation on top of the monument that holds the plaques as I placed my hand on the plaque itself. We stood there on an almost silent night as my dad kissed his hand and placed it on the plaque as he uttered the words, “I love you, baby.” As our group exited the garden, we were all given a candle to light as a song played in remembrance of our loved ones. This is certainly never anything we look forward to each year as that means a very important part of our hearts is missing. We would much rather have her here with us, but sadly, that just wasn’t part of God’s plan. Instead, we find a stronger meaning in this year’s Angel of Hope Ceremony as Melanie was present to pay tribute to and honor her mother. My sister’s birthday is December 13th. While we cannot do anything for her here on earth now to “celebrate” with her, we can gather every year – and have for the past seven years – on the first Saturday in December at the Angel of Hope Ceremony to honor her and others gone too soon. Every year on the first Saturday in December we gather at the Angel of Hope Garden to remember the children that have gone too soon. Regardless of the age of the child, whether a tiny baby or an adult, they are precious children, and their parents have either had bricks or plaques donated in their memory. My sister’s plaque is among those on the wall behind the Angel of Hope Statue. We have been gathering in this same place since 2009 when our Angel of Hope statue was erected. The one placed in our town was actually the 100th statue in existence and the only one in South Carolina. There are so many thoughts, feelings and emotions that go hand in hand with this time of year. When this should be the “most wonderful time of the year,” the truth is that a lot of people are struggling during the holidays. Our family has a hard time because not only is the Angel of Hope Ceremony the first Saturday in December, but my sister’s birthday follows shortly thereafter; December 13th. 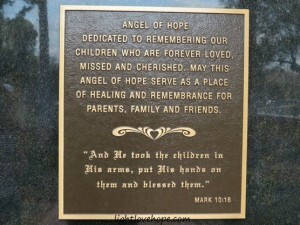 When I first learned of the Angel of Hope all of those years ago, I donated money for the plaque as a way to help our family with the grieving process. 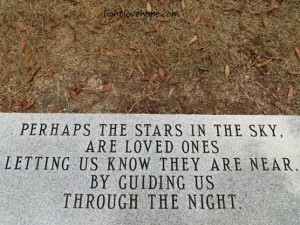 It is always so hard and heart wrenching to visit the cemetery, and I actually do not like going out there at all. I will, and I have to take flowers or to talk with her, but the truth is that I can talk to my sister any where, not just at the cemetery. In placing the plaque, it has allowed us to have another location to visit with her in the peaceful surroundings of the gardens that have flowers blooming in the Spring, Summer, and Fall, with Christmas decorations and lights in the Winter. It’s hard facing yet another holiday season without my sister. It’s been several years since we lost her, but the hole in our hearts is still there. We are missing several family members this holiday season from my sister, granddaddy, and now grandma, who passed in that order. It’s just a difficult time of year for a lot of people, yet few will mention anything about it. They just deal with it the best way they can and often in silence without saying anything to any one. My parents and I have that in common, unfortunately. My sister should be here getting ready to celebrate her 46th birthday, and yet … she’s not. She should be searching high and low for the perfect Christmas present for her daughter, and yet … it just isn’t possible. She left us way too soon, and we miss her a great deal, more than words could ever say. Go easy this holiday season. If you’re one that is also struggling, we understand, and please know that you are NOT alone. Don’t push yourself to do too much or to force those feelings aside. You have a right to feel as you do, and you are doing the right thing by acknowledging those feelings and being true to yourself. Go easy with others this holiday season as well. Every one that walks the face of this earth is fighting some kind of battle. We have no way of knowing what another person is going through so we have no right to judge. I will ask, though, that you consider other families, not just that of my own, that are missing loved ones that have gone on before them. It’s a difficult time of the year for so many, and they are in need of your loving kindness, compassion, and prayers. God knows who you are and what you are struggling with at Christmastime. Reach out to Him, and He will meet you right where you are. Feel Him wrapping His almighty arms around you providing comfort as only He can. I’ll be praying for you, my friend. Last night as I was reaching into my youngest daughter’s closet for a jacket that was way in the back, I found our little memory box. It was resting on a hanger right above the jacket I was reaching for, almost as if it was strategically placed there. I had almost forgotten about this little box. It isn’t because I forgot what it symbolized. No, I could never forget that. But, I believe, I had pushed this so far into the back of my mind because of the pain involved in the entire situation. You see, ten years ago I was pregnant and due to deliver in October of 2003. When we first heard the wonderful news that we were expecting a precious little baby, we were filled with so much joy and happiness! We were smiling so widely and dancing around with glee. That feeling was short lived as was the pregnancy as I was rushed to the hospital in extreme pain with a ruptured ectopic pregnancy. We were told at that time by the medical team that it wasn’t a “viable pregnancy” as it implanted in my tube instead, and as it tried to grow, it did so against the walls of the tiny tube thus causing it to rupture. I had emergency surgery, and due to the removal of the ruptured tube, my chances of becoming pregnant again were slim. We felt as if one moment we were happily swimming in the sea when a tidal wave appeared suddenly, slamming us into the rocks along the shore. We were crushed beyond comprehension. To say we were devastated by this news does not even begin to explain how we truly felt at that time. To hold dear to your heart or to share. This little box touched my heart tremendously when Jennifer sent it to me all the way from her home in California. She took the time to acknowledge the painful loss we had just endured and offered support in our time of need. She validated our child that should have been but just could not be. Whereas people like the medical staff and our relatives and friends moved right along after saying, “It wasn’t a viable pregnancy,” we could not do the same. Our lives were forever changed that day. We were so excited and filled with such love for this little one when we first heard the news that I was pregnant! We had such joy and happiness in our hearts and were looking forward to the day that we would see this precious little one’s face. The love we felt was indescribable. It was very much a viable pregnancy to us. We had such love, high hopes, and dreams that just would not come to be for this little one here on this earth. Jennifer will never know how much it meant to us then and still means to us to this very day that she took the time to hand paint this box for us. Every single stroke of her brush was done in pure love. At a time when she could not do any thing else to ease the pain we felt, she took out her painting supplies and got to work on this box just for us. Her loving kindness is displayed in her beautiful painting on this box with our little one listed. She didn’t just paint a generic box. She deliberately painted this box for us by placing our little one’s name on the box as well. Although these last few posts have appeared full of sadness and sorrow, I shared them as it is a time of reflection around the holidays. I can relate to the pain that others feel. I am not some type of super woman that is immune to heartache and pain. I feel it, too. I allow the feelings for a little while. I think back on that time in my life and how it shaped me and molded me to this very day. This entire message is not doom and gloom, but if you have stayed with me to this point, I want to let you hear me shout my praises to God above. Why would I when I lost a child? Because God picked me up out of my pit of despair, carried me in His loving arms through this storm in my life, and in HIS timing, He provided a miracle for our family. While I did not have this little one to love in this life, I still love … I always will love … and ONE day I believe that I will see my little baby in Heaven. I will finally get to cradle my baby in my arms, kiss the little forehead, feel the little tiny fingers wrapped around my own. I look forward to that day when I see my little one in Heaven. I believe my baby is there. I believe that my sister was there at the time the tube ruptured and the pregnancy was no more. I believe that God placed this baby into my sister’s arms for her to love, care for, and nurture this little one in Heaven. While I was here on this earth caring for my sister’s baby that she left behind at only two weeks old, my sister was now in Heaven caring for my own little baby. The miracle that I spoke of … although my chances of conceiving were slim at this point, God still had the final say! We went through procedure after procedure, and after one disappointment after another God, after crying out to God, begging and pleading with Him, He reached down His great and mighty hand and performed a miracle for us. God gave me the gift of my miracle baby that was born in late 2004. God took a nearly hopeless situation and turned it into something so very beautiful. God’s light and love offered hope for our hurting hearts … that is the message I hope that you will receive today. In a situation where our hearts were shattered, God picked up the broken pieces, kissed every single one and wrapped them in His love. His light shined down over our lives and turned the darkness we felt into light. He offered hope. He provided a miracle. This morning I remembered my little one that is in Heaven. I walked into my youngest daughter’s room and paused to admire her sleeping soundly in her bed with her beautiful curls falling slightly over the snow white skin of her cheeks. Watching her as she slept, hoping she was having peaceful dreams. I thanked God for my miracle baby that is now nine years old. I did feel the sting and felt my heart sink as I remembered my other little baby that never had a chance in this world. This little one would be ten years old right now. I allowed those feelings for a moment, then I shifted my focus back to the beautiful little miracle laying right before my eyes all snuggled into her bed. I thank God for the memory box. I don’t believe I found it by accident or that it had simply fallen off of the top shelf into this position where I would find it reaching for that jacket. It was truly as if it was placed there as a simple reminder that caring people still exist in this world. My friend, Jennifer, is living proof. There are no words to express my deepest and most sincere appreciation for what she did by remembering our little baby, by acknowledging and validating our feelings at a time when so many brushed it aside and went on with their lives. She took the time to reach out and touch our hearts with that of her own. I believe that the memory box was discovered right when I needed to be reminded of God’s goodness, His love, His compassion, His comfort, and of the miracle He performed in our lives. I also believe that at a time when we just attended a ceremony remembering my sister that this was also a sign to remember our little one along with my sister as our baby was a child lost too soon. Now I will look at the Angel of Hope a little differently when I approach her at the gardens the next time. I will stand before this angel remembering and honoring my sister as well as my baby that is being loved and cared for in Heaven by my sister and by the loving hands of our God. Thank you for taking the time to read my thoughts. It is Christmas time. A time of reflection and remembrance. I was reminded last night in words spoken at the end of a Christmas program that Christmas is not necessarily a time of happiness for a lot of people, but it can be a time of joy. Although I remember the sting, the sadness, and the pain, I remember God’s miracle and am once again filled with joy and happiness! It is my hope that although you have endured your own struggles, heartache, and pain in this life that you will still be able to find some joy this holiday season. Last night was the annual Angel of Hope ceremony. We attend every year, despite the cold temperatures that December brings. This year was not only cold, but it was raining as well. We almost did not go because of this. Although we were late, we went for one reason in particular – to support my dad, who we knew would be there rain or shine. We lost my sister 12 years ago in the most horrible way possible. Our hearts were shattered on that day back in 2001, and our lives will never, ever be the same again. We feel that a part of us died with her. We lost so much on that day. She never really and truly knew how much we love her and how much we would miss her. brothers, sisters, aunts, uncles, cousins, nephews, nieces, and dear caring friends. For so long it brought tremendous pain when we would go out to the cemetery. When we would go to take flowers to place on her grave, the intense and overwhelming grief would hit us, almost crippling us. Therefore, we decided that another place was needed to honor and pay tribute to my sister for those that just could not bring themselves to visit her grave. We want to celebrate her life, her beautiful life – not focus on how she died. The Angel of Hope provides comfort for us, and we feel a sense of peace come over our hurting hearts when we come together with others that have lost their loved ones as we honor them all during this annual ceremony. The speakers in our town actually lost their daughter at a very young age in an automobile accident. His little girl and my daughter were in the same class in school. She was a sweet little blonde haired beauty with an infectious smile. I could hardly believe the news coming in from other friends when we were all learning of the car accident shortly after it happened. My daughter lost her precious friend in fifth grade. This ceremony helps my daughter as well to cope with the loss of her dear friend. We feel a connection to the speakers – her parents and her sister – and their pain is real. Her father cries every time he has to read his own daughter’s name out during the ceremony. We feel his pain, we feel the heart break. We cry for his daughter, for my sister, for the loss of each and every one listed and those that are not listed for this ceremony. They usually begin the service with words from her father, a poem read by her sister, beautiful music to honor our loved ones, and then the names are called out for every child that a brick or a plague was included in the Angel of Hope Garden. The families walk down the path toward the Angel of Hope with her arms stretched out wide as if she is carrying our loved ones up to Heaven to be with our Lord. There is just something so very comforting about the presence of this angel, and we do feel that there are angels around us and God is with us wrapping His loving arms around us, comforting our hurting hearts as only He can. It’s such a short path, but in a moment like this, it feels like it is one of the longest, hardest roads we have ever walked. It seems like it takes forever from the time we begin walking down this path until we reach the end to see the Angel of Hope. There we either place a flower in her arms, around the base of the statue, or on the brick or plague donated in honor of our loved ones. We do a combination of placing a flower with the angel and then placing a flower on top of the wall which contains the plague for our angel, my sister, Pamela. Then we take our places next to those that walked before us, and we silently touch candles together to light a flame as a final song is played in honor of the children. They have a closing prayer, and everyone extinguishes their candles and turns to walk away. We were late last night and were not there when my sister’s name was called. Even though it was raining and bitter cold, we knew my dad would be there, even though my mom had already indicated that she was not going due to the weather conditions. We knew that my dad would be there, and we tried to get there in time to walk with him. We missed it by just a few minutes, but the important thing is that we did make it in time for him to be comforted by our presence. I walked up silently beside him as he held the lit candle, shielding it from the wind and rain with his hat. The look of sadness on his face is heartbreaking in and of itself. Without saying a word still, I shielded him, then, from the elements with my already extended umbrella. He glanced over at me, surprised at first to see me, then a look came over him that let me know he was glad I was there after all. He told me later that as long as he was able, he would be there each time that her name was called out no matter what. This is a hard time of year for so many, our family included. That is why I have been trying so hard to be an encouragement to others with the words I have written on this website. We hurt. There is intense pain and grief that we are feeling at this time of year especially, and we miss our loved ones terribly. We allow the feelings. We honor my sister in this way each and every year. It is our way of honoring her life at Christmas time but also honoring her close to her birthday, which is December 13th. We should be celebrating her birthday this coming week with her here physically with us. We know that we carry her with us daily as she is always in our hearts. Love is eternal. We may be separated for a little while right now, but our love lives on. In honor and memory of Pamela. We love and miss you so much!